Yesterday, Doug (fitz43), myself, and Geri met in West Vancouver for a chat and a trunk swap meet. I was returning Doug's Phase Linear 400 amplifier (http://forums.phxaudiotape.com/showthread.php/3912-Phase-Linear-400-(Early-Model-Run)-On-Loan), which I had been borrowing for the past five plus months. 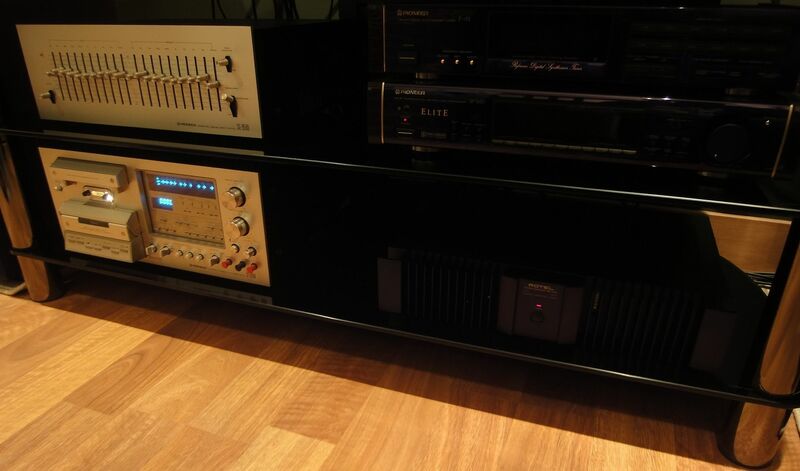 Before the PL 400, Doug had offered his modified PL 700 B to try out (http://forums.phxaudiotape.com/showthread.php/3814-Phase-Linear-700-B-On-Loan). I would never say no to such an offer. Doug had also tapped into a fellow he met at a small audio fair, who was selling sealed cassette tapes. So, I was very fortunate to have Doug pick up a bunch of nice sealed cassettes and some new MiniDiscs to help replenish my stock. He brought these to the meeting we had. Thanks for doing that, Doug, as both he and I got a good deal on NOS tapes and MDs. Please say thank you on my behalf to the seller as I'm quite happy with what I have received. Thanks for alerting me to these items and taking the time and trouble to acquire them for me. 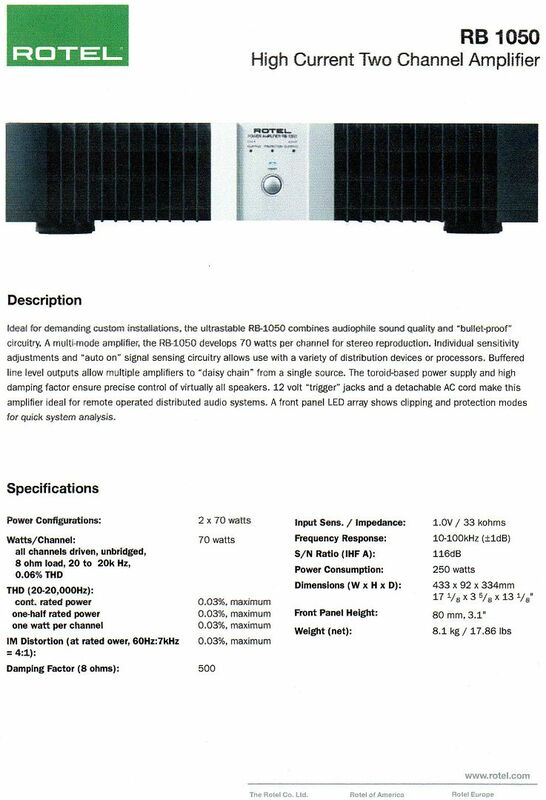 This is the third power amplifier I have been given by Doug to try out. It may not have the super-power output of both Phase Linears I had demoed before this one, but it has some good amp characteristics. I did patch it into my system last night, but didn't get much of a chance to play it. I think this Rotel would make a great combination with the PS Audio IV preamplifier I picked up a short time ago. I haven't tried the PS Audio IV, yet, but I plan to set up a small system using the Rotel amplifier, PS Audio IV preamplifier, Ariston Audio RD-80 turntable, and Pioneer RT-707 open-reel deck. I haven't decided on which speakers - perhaps, the Leak Sandwich speakers. I will take some better pictures of it, later. I haven't tried the PS Audio IV, yet, but I plan to set up a small system using the Rotel amplifier, PS Audio IV preamplifier, Ariston Audio RD-80 turntable, and Pioneer RT-707 open-reel deck. I haven't decided on which speakers - perhaps, the Leak Sandwich speakers. I used a Rotel RB-1080 for several years before catching the White Oak Phase Linear bug. I sold it so I had cash for a speaker upgrade. I miss it sometimes. The 1080 had a dark sound. I will be interested to read your impressions of the Rotel. My first amp was a Rotel. I like their sound. Doug had also tapped into a fellow he met at a small audio fair, who was selling sealed cassette tapes. So, I was very fortunate to have Doug pick up a bunch of nice sealed cassettes and some new MiniDiscs to help replenish my stock. He brought these to the meeting we had. Thanks for doing that, Doug, as both he and I got a good deal on NOS tapes and MDs. Please say thank you on my behalf to the seller as I'm quite happy with what I have received. Thanks for alerting me to these items and taking the time and trouble to acquire them for me.Nando. No problem. I still have to find out about the used MDs. Maybe I'll get a chance to test out the Nak after tomorrow. I was in the midst of recording a new mix tape last night. There are a few tracks on the Master I am using to record from that are a good indication of the performance of the Rotel RB-1050 amplifier. One particular track, Black Sabbath's "God Is Dead?" has a punchy drum set. I didn't feel the bass was muddy. In fact, the amp sounded better for dynamics as I drove it a little harder. Perhaps, the high current capability and good damping factor number is the reason behind this. I used another track to gauge the vocals and mid range; very nice on playback, and I picked up a few subtleties, like the voice echo at the end of lyric, that seemed more pronounced than what I heard with the Phase Linear 400. It may be the speakers play a bigger factor in the match to this amplifier, as there have been comments by others owning this particular model of amplifier that the sound is seemingly flat. For a 70 wpc amplifier, this amp surprised me. And with the lower profile, I could easily stack one on top of the other to match the size of the PL 400. Let us know how that Nakamichi does for you - you might be pleasantly surprised, Doug. Hey, if there are a few used MDs to pick up I would be interested. The batch of used MDs Ben sent me have so much good music on them, the bulk of them I won't be recording over. Have you had time to run this amp thru your listening tests? Doug: I have had plenty of time using your Rotel. We will make arrangements to meet again so I can return it to you. What impressed me most was its ability to have the dynamic punch when needed. Most of my listening is done at moderate levels using less than 10 w.p.c.. This is usually when I am playing back through my system after finishing a recording. I haven't had a new amplifier in my system before the Rotel RB-1050, but anyone considering a newer amp should test drive one of these. My father needs to catch wind of this try-out of yours. The comments you have heard that say the amp sounds flat, may actually interest him. He LOVES flat. He always has the bass off and the highs down every time I come over. His music always sounds like the singer is singing through a brown paper sandwhich bag. But that's his ears. He's looking into the new higher rated Rotel amps. Something in-line with the 500w range. Dunno if that was per-channel or total. I just know that's the number he rolled off to me. I have not investigated their current line-up. But your demo will be an interesting thread to follow. That might be the one he is gandering at. OR the new version of it. I saw it there. No VU meters and I am sure the price exceeds that of a WOPL. But It's the SOUND that makes him decide where his money goes. That's where your review is helpful. Something in-line with the 500w range. Dunno if that was per-channel or total. I just know that's the number he rolled off to me. I have not investigated their current line-up. But your demo will be an interesting thread to follow. Just in the process of getting this little amp. It is very similar to the 970 MkII I had many years ago. Dynamic punch is what Rotel does very well and was the first amp to introduce me to this type of sound, being high current. Well, how do! Good seeing you, Scott!